Get your kids involved in the family dinner rotation with these easy meals that kids can make with little or no help! Kids can cook, too! 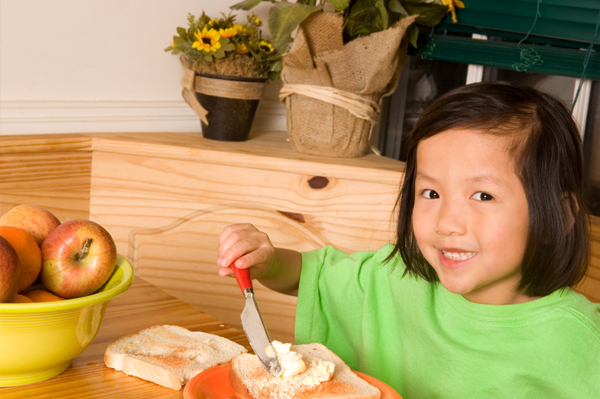 Believe it or not, letting kids get into the kitchen to make their own meals sometimes is good for both of you. They’ll feel a great sense of accomplishment and you’ll have a little less prep work to do. Here are a few good ideas for kid-made-meals! Love homemade pizza? Your kids will have a blast making their own with this simple method from mom of four Stacey Burbach. She says that her three oldest children, ages three, five and seven, love making these easy pizzas. To make them, use a premade crust. Or Burbach suggests rectangular lavash bread from Trader Joe’s. You will also need pizza sauce, shredded cheese (mozzarella is best) and toppings like pepperoni, sliced bell pepper, olives and mushrooms. “You can easily cut all of these veggies ahead of time and pop them into a Ziploc baggie. When you are ready to assemble, simply lay out the baggies and help the children assemble their own pizzas. Put the sauce first and then the cheese and then layer whatever else your child wants on the dough,” says Burbach. Then bake at 350 degrees for about 10 minutes. “I always lay the pizza slices out on a bread board in the shape of a smiley face. Put it in the middle of the table and let each child giggle at their piece being the ‘eye’ or the ‘smile’ on the board. Super easy,” says Burbach. Love quiche? It’s a surprisingly easy mix of eggs, cheese, sometimes veggies and a premade pie shell. Definitely easy for a young chef. You’ll need to put it in the oven, though. Chicken nuggets are a childhood favorite — even for kids who eat mostly healthy foods. So, why not capitalize on that with a fab kid meal? Julee Morrison of Mommy’s Memorandum says this is her three children’s favorite meal to make. “My children, ages five, seven and nine can make these on their own. My five-year-old does require minimal supervision with the toaster oven, but aside from that, it’s easy and they love making them,” says Morrison. Her kids make chicken nugget sliders using nuggets, cheese, lettuce, tomato and slider buns — and they eat them with a choice of dipping sauces like honey mustard, barbecue sauce and ranch dressing. >> Do you have any kid-friendly family fave meals?